The superintendent of schools in Beaufort, SC, 1960's, is desperate for anyone to teach school on Yamacraw Island (FIND ME A BODY). The school there is run by a tyrannical black principal, Mrs. Brown, and has been totally neglected by the school system-no books, no blackboard, no attention being paid to the students. In fact, one has to take a boat from the mainland to even reach the island. 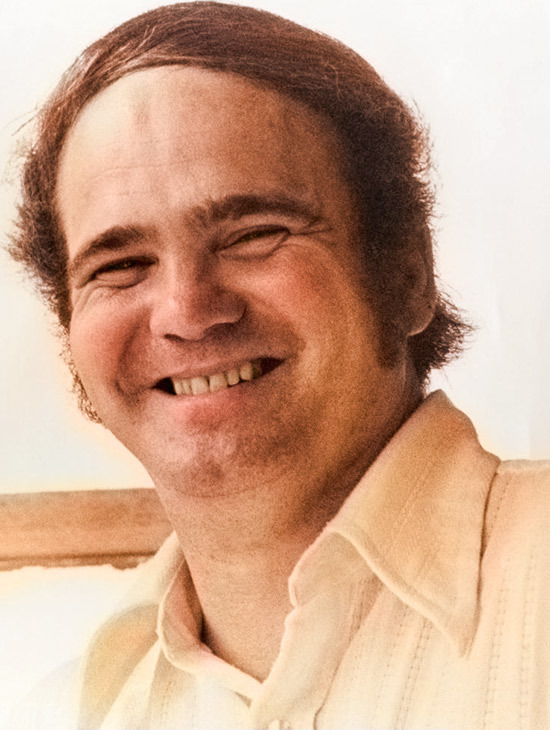 Into this hornets' nest walks Pat Conroy, almost thirty, idealistic the way only a 60's hippie could be, and recently fired from his twentieth job in five years (PUSHIN' THIRTY). He is only too happy to answer the ad for a teacher, especially since Dr. Piedmont informs him that "no experience is exactly what I'm lookin' for." As the boat sails for Beaufort, Conroy sings that "Maybe this time" he has found the life he's been searching for. The Old Folks - Edna, Kate, Quik Fella, and Sam-greet Conroy on the dock. He charms them all, except Sam, who greets him with stony silence. Mrs. Brown greets Conroy with "Welcome overseas." He is about to find out just what she means as she leads him to the schoolroom. The Old Folks, beaten down by past experience, predict Conroy will leave just like all the other children. Not Edna. Backed up by the timely answer to her prayer for help, she sings a spirited gospel that convinces the others that this time is different (HE GON' STAY). When Conroy meets the children-Cindy Lou, Mary, Prophet, Anna, Top Cat, and Richard-he discovers that they can scarcely read or write, they know little math, and they are wildly undisciplined--except when Mrs. Brown enters the room. Then they are weak and submissive. Out of earshot of the grown-ups, the kids sing their good-riddance to the man they dub "Conrack" (BYE, BYE, CONRACK), but their anger barely conceals their desperate need for a teacher who will actually care. Slowly but surely, the kids, Mrs. Brown, and Piedmont wear down Conroy's initial enthusiasm. He informs Edna that he is leaving. In the beautiful spiritual THE WATER IS WIDE, she begs Conroy to stick it out just a little while longer, and he agrees. Conrack finally reaches the kids by showing them a poster of Beethoven and telling them how this genius was actually a lot like them: a rebel, poor, his father beat him. In a series of teaching vignettes, with the Old Folks backing him up, the kids learn some basic facts, and the most basic fact of all: they are worth something ("HEY, I'M TALKIN' TO YOU, BEETHOVEN). But just when Conrack has finally reached the kids, their achievement is threatened by the arrival of Dr. Jackie Brooks from the Department of Education, who has arrived to determine whether the school should continue to get federal money, or whether it should be closed. Jackie is African-American, but unlike any these island folks have ever seen: suave, sophisticated, and not about to be fooled by any more white talk (WHITE LIBERAL TO THE RESCUE). Conrack eventually convinces Jackie not to close the school right away but to give him more time to bring these kids into the twentieth century. He is planning a trip to Beaufort to go trick or treating, an idea these kids have never heard of, when Mrs. Brown comes to the dock to stop him, saying he can't take the kids out of school because he didn't go through proper channels. This kind of authoritarian attitude only makes Conrack more determined to defy Mrs. Brown and go across that water, but shy little Mary refuses to get in the boat. Conrack is stunned to learn that she can't swim-indeed, none of them can swim and they are surrounded by water. Things look desperate until Jackie, who has befriended Mary, promises to hold on to her the whole way across, and the act ends with the Old Folks waving good-bye from the dock as their grandchildren set off on a great adventure across the river (OUR NIGHT TO HOWL). 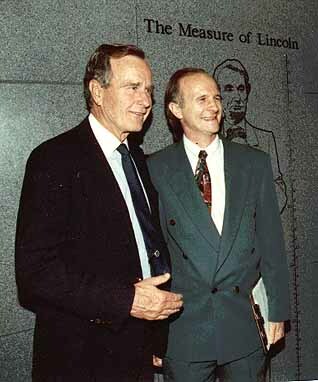 Former President Bush & author Granville Burgess. That evening, the kids, Jackie, and Conrack are in his friend's hippie pad, when Cindy Lou suddenly asks, "Jackie, is you an' Conrack makin' it?" They shuffle the kids quickly off to bed, then Conrack confesses to Jackie how afraid he is that he'll lose this job just when he's starting to find something he can really do well. Jackie is more convinced that the children need to come to the mainland and to get integrated into society in a way they never can living on an island. Conroy gets her to say she'll give him a positive recommendation on the grant. Relieved, he brings out a bottle of J. W. Ripple and they celebrate a wonderful evening while playfully acknowledging that their growing attraction for each other would never work (TOTAL MISFITS). A week later, Piedmont fires Conrack because he doesn't like people who are rocking the boat. Conrack vows to take his fight to stay on to the school board. When he confronts Mrs. Brown for the reason she filed an official complaint to Piedmont, she reveals that, in her own way, she is trying to protect the kids from the same sorrows she endured. In an anguished ballad, she sings how "No one tells you/Hopes will hurt you/Dreams desert you" (HOPES AN' DREAMS). After Conrack leaves, Richard enters with some flowers for Conrack. He confesses that he is the child who earlier had peed on one of the government's desks, and bends over for Mrs. Brown to beat him, as usual. But she can't and tells Richard to go ahead and give the flowers to Conrack. Richard takes out one scraggly flower, gives it to Mrs. Brown, and runs off. The Old Folks, the kids, and Conrack are making protest signs for the school board meeting. Conrack suddenly wants to call the protest off: he knows you can't beat people like Piedmont. But in an infectious Jamaican-influenced dance number (LOOKIN' GOOD), the Old Folks convince Conrack to carry on the fight. In a rambunctious meeting with the school board, the kids, Old Folks, and Conrack make their case. When Mrs. Brown makes a surprise appearance and officially withdraws her protest, it looks as if they've won. But Piedmont simply rejects Conrack's appeal in an example of old-fashioned political power. Conrack, depressed, is packing to leave when Mary comes to say good-bye. 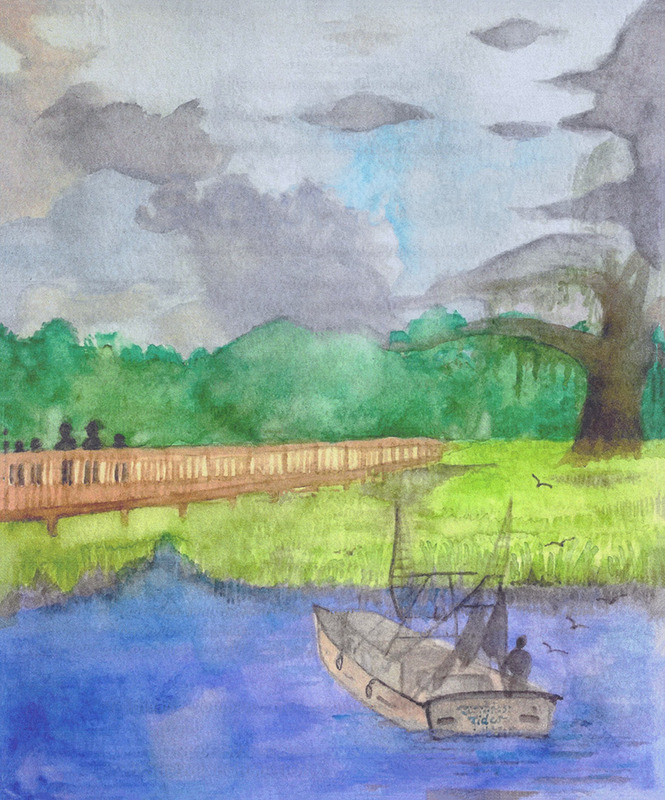 She confesses to him that something strange has been happening to her, ever since the trip to Beaufort: she has been drawn to go across the water (CITY LIGHTS). Conrack tells Mary how much she's grown in the short time he's been there. 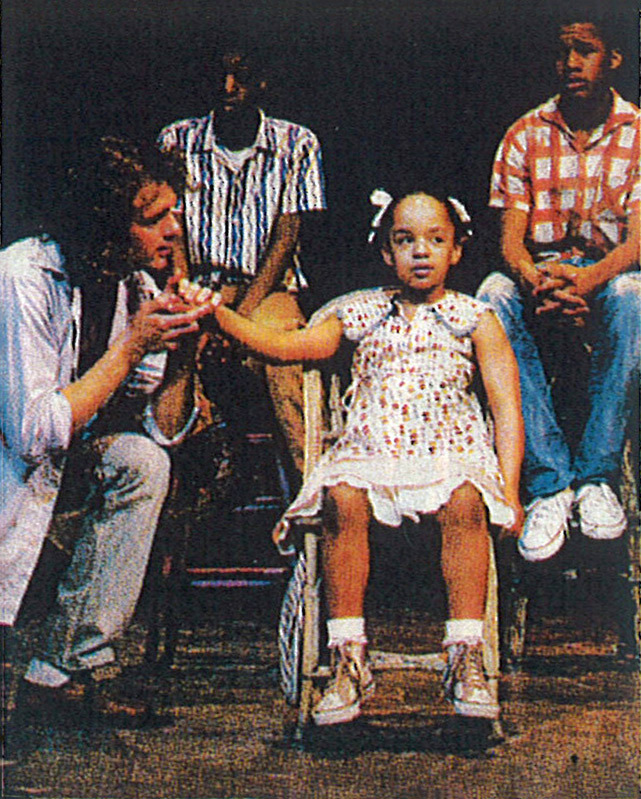 She tells him the words he's been waiting to hear: "You the best teacher ever crossed that water." At the dock to say good-bye, Conrack consoles the kids by singing "Sometimes you show your love by letting go" (LETTING GO). He has grown up, too, and is now ready to face the world on his terms: becoming a teacher! Edna gives him the final blessing: "May the river be good to you in the crossin'," and Conrack sails away to a promising future, leaving behind children and old folks full of self-esteem and memories of a teacher who really cared. 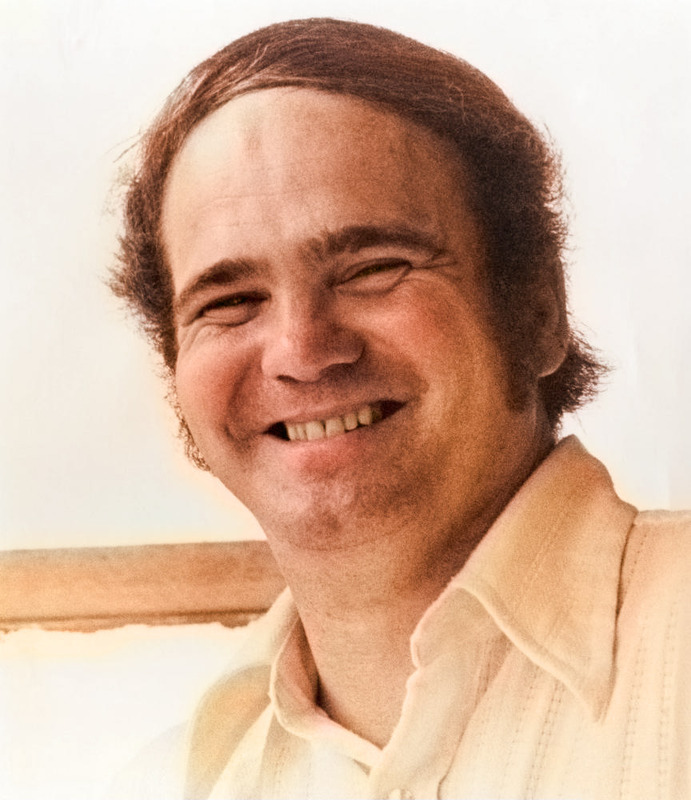 Pat Conroy, author of memoir "The Water Is Wide." White Liberal to the Rescue? 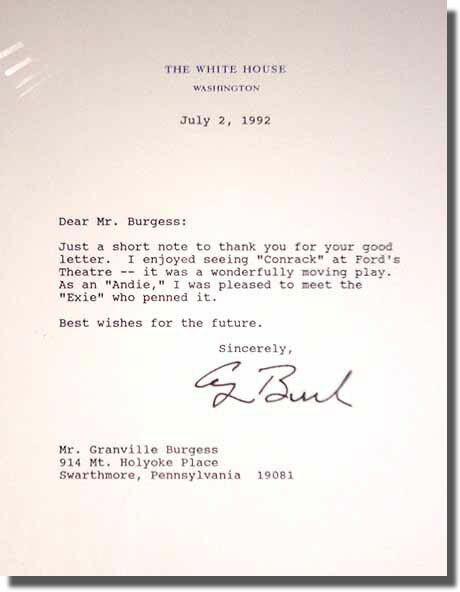 A thank you note from former President George Bush. 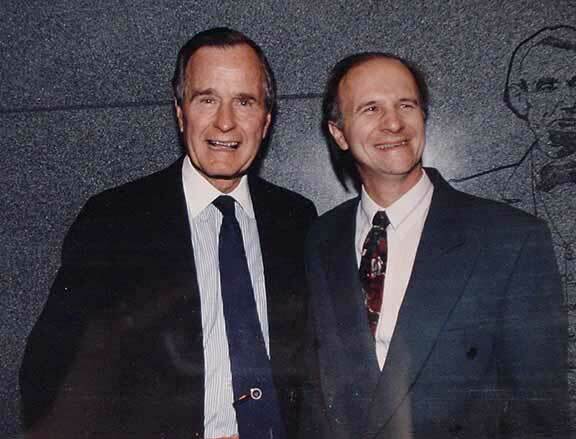 Click on image to see a larger version.